Happy Saturday, everyone! We have a busy day today. We have two graduation parties to attend, then Chris and I are going with my parents to see Jersey Boys tonight -- I can't wait! Here's a preview of one of the June releases from C.C. Designs -- Layla. You'll meet her friend Virginia tomorrow. The new stamps will be available June 4 at All That Scraps. Layla and Virginia will be sold individually and as a set. The set contains four sentiments -- two for everyday cards, and two for more "American" cards. 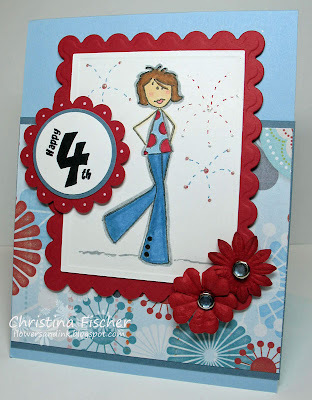 I wanted to use this fun paper from Sassafras Lass, so I went for a fireworks theme on this one! I colored Layla with Copics and drew in the fireworks with SU! markers. I added a little sparkle with a Stardust pen. I used my rectangle Nestabilities on the image panel and scalloped mat. I forgot I had these SU! rhinestone brads -- they were perfect for the flower centers. Happy Friday!! Another weekend is on the way! Here's a card for AmyR's Friday Sketch. 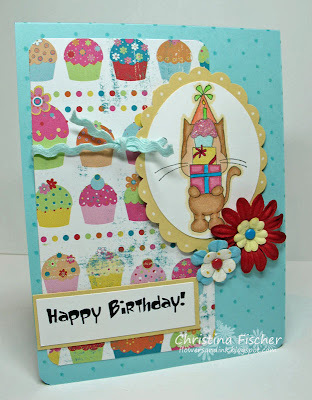 This one was fun -- this great cupcake paper from Junkitz was my inspiration! I just love this image of Lulu behind all the gifts. I stamped it in Brilliance Graphite Black ink and colored it with Copics. I added some Stardust Stickles to the cupcake icing. The ric rac is from the retired SU! Seaside ribbons, and the flowers are from Prima. I've had this idea in my head for a couple weeks now, and today's Ways to Use It Challenge was just the reason to make it happen! 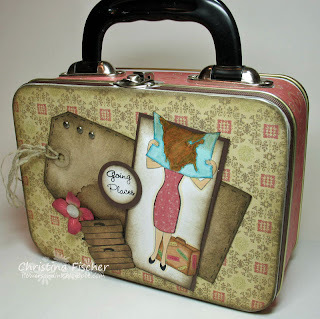 I thought this lunch tin from All That Scraps would be perfect paired with Going Places by My Favorite Things. Since today's challenge was to "Get Packing," I created a little "luggage" for my two little girls. We are going on a Disney Cruise in a few weeks (yipee!! ), so this will hold their crayons, papers and travel games while we drive to Florida. I covered the lunch tin with paper from K&Company and some Chocolate Chip grosgrain. I sanded the edges of the paper and sponged them with Walnut Stain Distress Ink. I stamped the image, paper pieced her dress, and colored the rest with Copics. 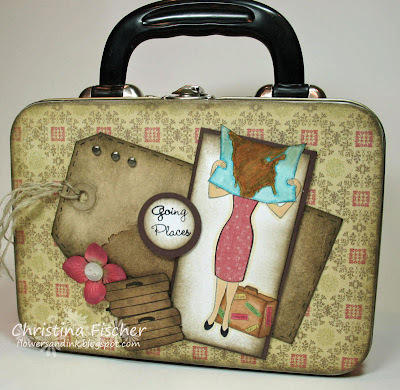 The luggage was stamped on more patterned paper and cut out. All the edges of the images and sentiment were sponged with the Distress Ink. The tag is one I've had in my stash for a while. I actually bought it already stained, but I added more Distress Ink to the edges and drew some faux stitching. Good morning! Happy Wednesday! I have another ATS Challenge to share with you. Christine challenged us to use three different ribbons on our projects. Not a problem for me! ;) I've been combining ribbons a lot lately -- it's a simple way to add some punch to your projects. The Infuse paper dictated my ribbon choices -- my three favorite colors, too! I've been asked how I create the bows with different ribbons. I cut the strips of additional ribbon, then I slide them through the knot of the main ribbon just before I pull it tight. It takes some finger gymnastics sometimes, but these SU! grosgrains are easy to work with! 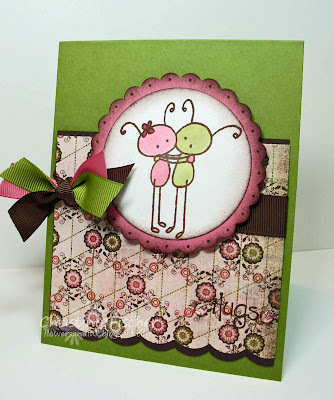 For the rest of the card, I stamped the Luv Bugz in Basic Brown and colored them with an Aquapainter and inks. I colored the girl bug's flower with a Regal Rose marker. I sponged the edges of the circles with Chocolate Chip and added dots to the scallops with an Old Olive marker. I created the bottom scallops with a corner rounder. 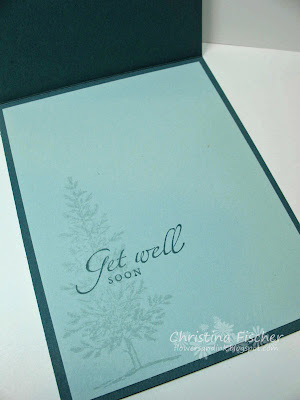 I stamped the sentiment onto the patterned paper in Chocolate Chip ink and placed a Dew Drop on either side. The scalloped circle is mounted on Pop Dots. We'd love for you to play along with the challenge! If you do, link back here or post it to the ATS Gallery. Christine will be posting the Design Team samples on the ATS Blog later on today, and you can link your creation there as well. Hello! I hope your weekend was a good one! After a busy few days, it's good to be back to my "normal" schedule! 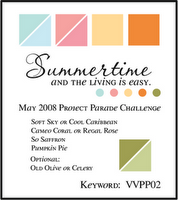 I had been wanting all weekend to do the color challenge for the Verve Visual May Project Parade. I actually went to bed thinking about this card! It's a simple, uncluttered design, and I really like the way it turned out. 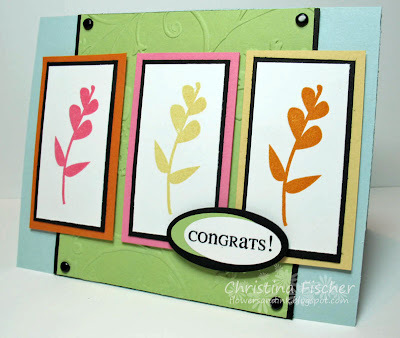 The celery panel is embossed with my Cuttlebug and Stylized Flowers embossing folder. Everything else is just simple stamping! I used SU! oval punches for the sentiment, and I added some black brads. The image panels and sentiment are mounted on dimensionals. Hello! I'm leaving shortly for the bridal shower, but I wanted to show you the centerpieces I made. There's only a little bit of stamping here, but I thought they turned out so cute! You can click on the photo for a better view. Because of the cherry theme of the wedding, the colors are red, lime green, and pink. 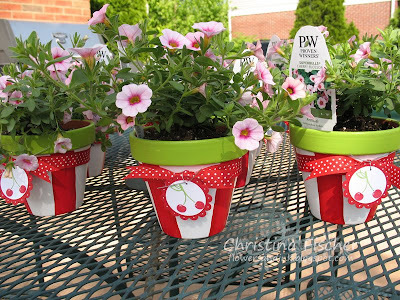 I purchased the terra cotta pots and painted them, then I added some ribbon and a cherry tag. 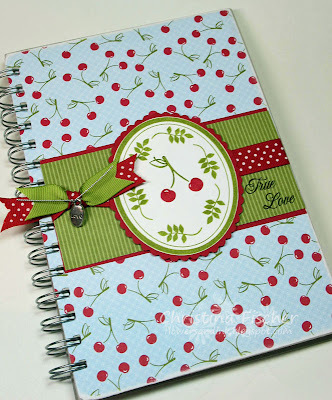 I am definitely getting my mileage out of this cherry stamp from Tart and Tangy! That's it for now. After the shower I'm headed to Louisville for the last of Megan's volleyball tournaments -- yay! It's a three-day holiday tournament (doesn't anyone want to celebrate the holiday at HOME?!?) Chris has been there with her since yesterday, and I'll go relieve him after the shower is over. I will be very glad to see Tuesday, I'm telling ya!! ETA: I was asked what I used to paint the pots. 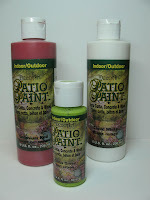 I used Patio Paint by DecoArt, purchased at Michaels. Sunday I will be co-hosting a bridal shower for my best friend's daughter. Instead of shower games, I decided on a different way to have "audience participation." 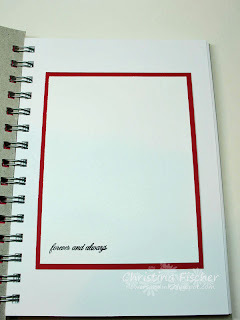 I created this "Advice and Best Wishes" book for her. She is getting married in July in Michigan during the Cherry Festival. The theme, of course, is cherries. Yay -- another reason to use my Summer Picnic paper! 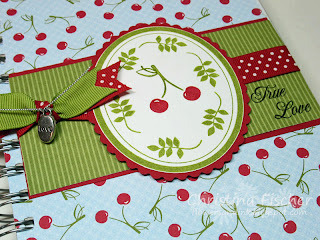 :) The cherry stamped image is from Tart and Tangy, but all other images are from Alli Miles' gorgeous set Wedding Day by Papertrey Ink. Here's a closer look at the details. The oval frame was stamped in Old Olive ink and then cut out. I stamped a frame around the cherries with the leaf image. I mounted the oval on Real Red cardstock and trimmed it with decorative scissors. The sentiment was stamped onto the paper in Basic Black. The little charm says "love" and is tied on with silver cord. The dotted ribbon is from Michaels, and the olive ribbon is from SU!. I created an assortment of cards on which the shower guests will write either words of advice or best wishes for the bride-to-be. The sentiments are also from Wedding Day -- the font is so beautiful! Click on the photo for a better look. Hello there! We're halfway through the week -- things are moving too fast! Have you ever seen "The Upside Down Show" on Noggin? If you have little ones, you probably know the show. Shane and David ask the kids who are watching to use their imaginary remote control to rewind, slow down, and play the events taking place. Right now I really wish I had a remote with a giant PAUSE button! I could freeze time until I catch up!! Anyway, I made this card for a neighbor who just had surgery for prostate cancer. I'm sending over a gift certificate to a local restaurant (since I haven't had much time for cooking meals lately!) and some spiced vanilla bread (because there's always time for baking!). :) I combined this week's Color Challenge and Sketch challenge. 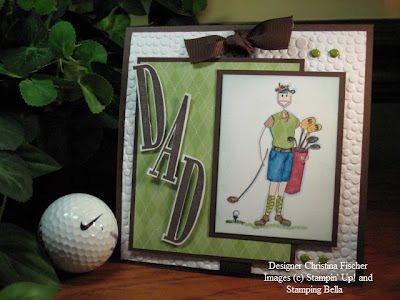 To create the background, I used my Scor-pal to make a grid pattern on the Soft Sky cardstock. I scored at 1/4" intervals. The image is stamped in Certainly Celery and Blue Bayou. I distressed the edges and sponged them with Soft Sky ink. I placed the sentiment in a window. First I punched out an opening from the Soft Sky background with my Word Window punch. Then I placed that layer over the Blue Bayou card base and traced the inside of the opening. 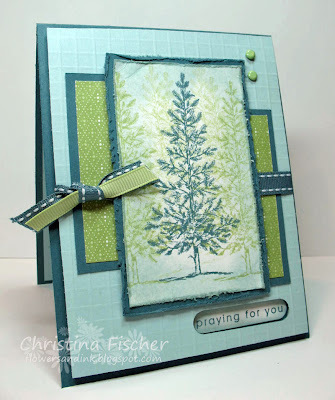 I stamped the sentiment on Whisper White, punched it out with the Word Window Punch, and adhered it to the Blue Bayou card base over the traced window. I then raised the Soft Sky layer over the Blue Bayou layer with Pop Dots. I embellished with brads and ribbon, and I finished the inside of the card as well. I'll be spending the next couple days working on projects for the bridal shower -- I hope you'll stop back to check on me! Hello! I have Caroline's teacher gifts finished! I was up waaaay too late last night, but I just couldn't stop until they were completed!! You may not know this about me, but I am a teacher by profession. I have a Bachelor's Degree in Elementary and Special Education, and I have a Master's Degree in Elementary Education. I haven't had my own classroom in 16 years, and my profession is now SAHM, but I still love "teachery" things! That's why I have so much fun making gifts for my kids' teachers -- I know how hard they work, and I want them to know they're appreciated! When I saw Kim Hughes' set Making The Grade at Cornish Heritage Farms, I HAD to have it!! All the images used on these gift sets are from that stamp set. And, how perfect is this Summer Picnic paper?!? The inspiration for the projects came from two places. For the note cards, I cased Valerie Stangle's (11Valerie11) set HERE. 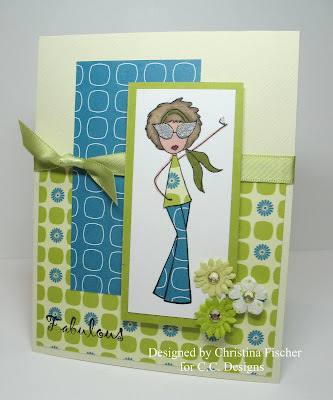 I just love her style -- so clean and fun -- and I fell in love with the set she made! I changed it up a little bit by using different images and papers -- but the layout is basically the same. I packaged the notes in a clear box from Papertrey Ink. I've seen the little clipboards around quite a bit, but most recently by Jen Javorsky. I added some little tags and a stamped apple. And yes, I did stamp each one of the sheets with that apple -- I'm insane. Good morning! Another week has begun! This is going to be a busy one for me -- two of my kids are finished with school this week, and two are finished next week. I have lots of teacher gifts to get finished! Plus, I'm co-hosting a bridal shower on Sunday, and there are many things left on my to-do list! I'll have some cute shower projects to share with you later this week! But first, I have this card to share today. 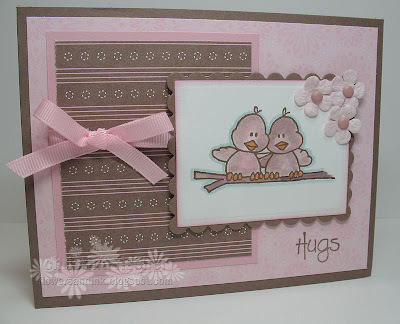 Christine at All That Scraps challenged the Design Team to create a project using only pink, brown, and white. This is the card I made for the challenge. The image and sentiment are from C.C. Designs. The birds are from Love Ya Much, and the sentiment is from Little Penguins. I watercolored the image with an aquapainter and SU! inks. To give the image some dimension, I drew around it with a blender pen and Soft Sky ink. 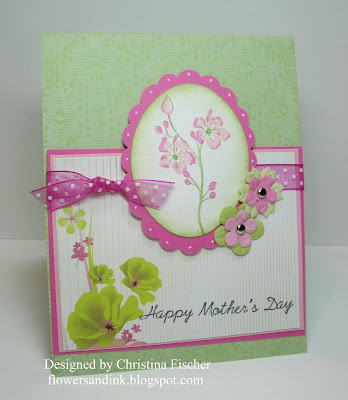 The image panel and mat were cut and embossed with my new Nestabilities (Happy Mother's Day to me!). 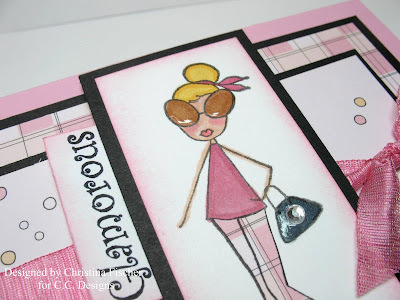 If you'd like to play along with our Pink and Brown Challenge, leave a link to your creation here or post it on your blog, your SCS gallery, or the ATS Gallery. 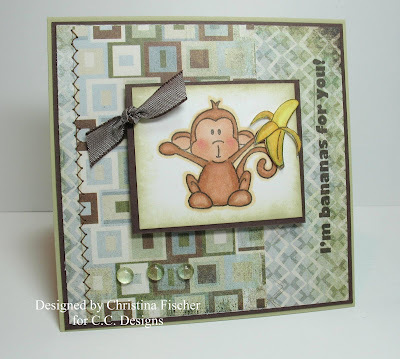 Christine will be posting the DT projects on the ATS Blog later on today! Here's a card I made for my friend's son's birthday. I was feeling a little mojo-less, and I needed to come up with something quick, so I went back to my old cards for inspiration. 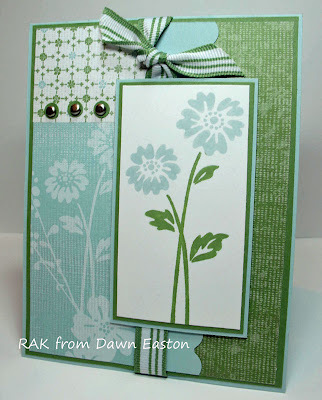 I liked this card I made so much that I just flipped the sketch and used a different stamp! I also used a different pattern from the same Summer Picnic paper -- this one has more "boy" colors in it! Happy Friday!!! Geez, where do the weeks go? Here's a card I made today -- it was supposed to be for the Limited Supplies Challenge, but I kinda strayed from the challenge. 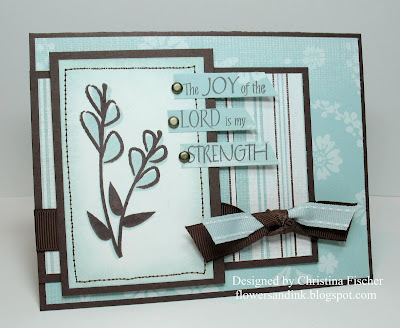 The challenge is to use alphabet stamps as a sentiment and as the focal image of the card. Well, I used alphabet stamps for my sentiment (Playful Caps from CTMH), but it's not exactly the focal image! I needed a graduation card for my neighbor, and I HAD to use Diplomabella, so I guess the sentiment and the Bella are sharing the stage on this one! The school colors are -- you guessed it -- blue and gold. The paper is SU! More Mustard Prints, and the cardstock is SU! Night of Navy and Whisper White. I colored with Copics, sponged the edges with More Mustard ink, and added Xmas Red Stickles to the roses. I pierced around the edge and embellished with SU! brads and May Arts satin ribbon. While we're on the topic of alphabet stamps as the sentiment, I have something exciting to share with you!! 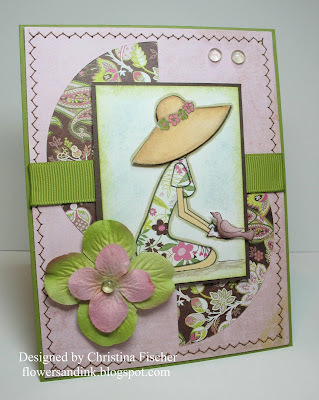 This card is in the June/July 2008 issue of Paper Crafts Magazine!! It's my first Paper Crafts pub!! WOOHOO!!! 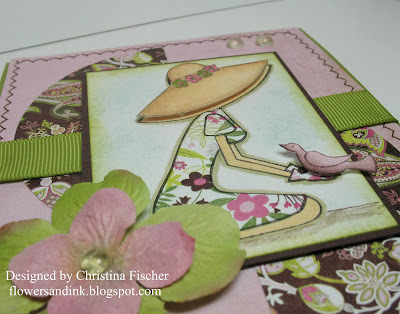 Here's my card for today's Sketch Challenge at SCS. This was a fun one -- I don't think I have ever used a layout like this before. I used another set from Verve Visual -- Seeing Stars. The paper is from the Boxer 6x6 pad by BasicGrey. I stamped the large and medium stars onto the patterned paper, cut them out, and mounted them on dimensionals. The star eyelets are from Close to My Heart. I Finally Got My Verve On! 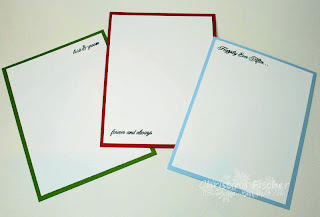 I have been a stalker of Julee Tilman's blog for a while, and I have had many Verve Visual sets on my wish list -- well, I finally took the plunge! I'm glad I did, too -- the stamp designs are beautiful, and they stamp so well!! Anyway, I received my first sets yesterday and went immediately to Julee's Mojo Monday Sketch for inspiration. I cut apart the sentiment to create the tabs called for in the sketch, and I sponged and stitched around the image panel. Other than that, it's pretty simple! 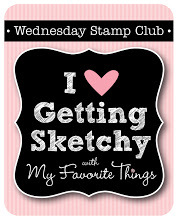 Stamp set by Verve Visual; all other products Stampin' Up! ... I'm the First Runner-Up! I just got home from the volleyball tourney and checked out the MFT Forum -- and there was the happy news! 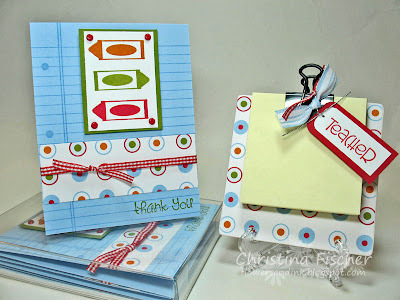 I got to choose a free MFT stamp set -- how fun! The winner is susiestampalot -- she made a hilarious Doggy Duty scooper and an adorable bunny apron card! markie's mom is the second runner-up -- her "It's a Jungle Out There" mirror project is fantastic! All the entries were so great -- I don't know how the judges did it! I'm worn out from a long day, but I wanted to pop in and share my news! Thanks to all of you for your sweet comments on my entry! To all of you mothers out there, have a fantastic Mother's Day! I'll be hanging out with my family tomorrow, but I hope to get some stamping time, too! Happy Friday! Another late post, another busy day! I went to the Cincinnati Zoo with Anna and her kindergarten class today. We packed a lot into a few hours! I think love was in the air among the animals today -- the male monkeys were putting on quite a show, and the peacocks were strutting their stuff! 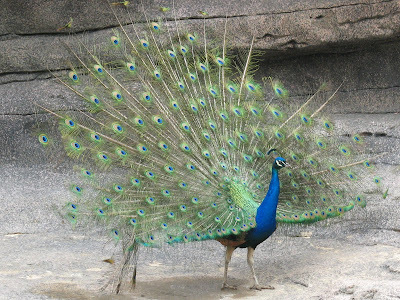 The peacocks and peahens roam freely around the zoo, and rarely have I seen so many males with their feathers extended. I snapped a photo of one of them -- isn't he beautiful? The card design is pretty simple. The backgrounder is stamped in White Craft ink. I inked the flower image with SU! markers, and the sentiment is stamped in Basic Gray. I embellished with some ribbon and Primas, and that's it! Remember the tic tac toe board I made for Christmas? I figured this challenge was a good reason to make a spring game! My little girls love to play tic tac toe, so now they have a couple boards to choose from! The altoid tin is from Gina K. Designs, and it will hold the game pieces when they're not in use. This was fun to make -- not very complicated, just a lot of coloring! :) Thanks for visiting today -- I'll have a Mother's Day card to show you tomorrow! Have a great day! Hi there! Well, it's another late post for me! My internet was out until about 9pm -- just in time to pop in at the MFT release party -- so I'm finally getting around to posting today's Sketch Challenge card! I used Can Ya Dig It? by My Favorite Things. I can't get enough of this Sultry 6x6 pad! I cut out a 3 1/2" circle with my Fiskars Circle Cutter, then I cut it in half.I paper pieced the dress and gloves and colored with Copics. I sponged around the image with Soft Sky and River Rock inks. The hat was cut out and mounted on dimensionals. Instead of having the girl gardening, I thought it would be cute to have her holding a little friend! :) The bird was stamped on the same paper as the background. I cut it out, sponged the bottom to give it some dimension, and mounted it on a rolled up glue dot. Hello! I am moving slooooooooooowly today! Chris and I went with our friends Traci and David to Columbus yesterday to see The Police in concert. The last time I saw them was during their Synchronicity tour when I was in college! OMG, they are as AMAZING as ever!! Sting does not age, I'm telling ya! Anyway, we got home very late, and I am TIRED! I had to wake the kids at 6:40 for school, and I've been in slow motion since! I'm working on some Mother's Day projects, but nothing I can share yet. So, I thought I'd show you this magnet that Traci gave me. 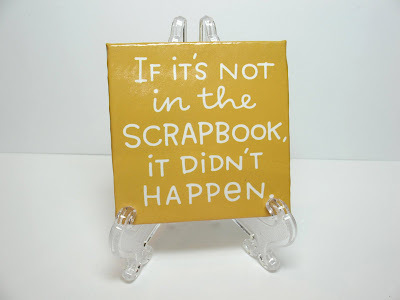 I hope it brings a smile to all my scrapbooking friends! The card size is 4.25" square. I colored the monkey and banana with Copics. The banana was cut out and attached with rolled up glue dots. I sponged around the image panel with River Rock ink. I embellished with some machine stitching, Peony Dew Drops, and some taffeta ribbon. I wish you could SMELL this card! I used some Banana Card Scents on it, and it smells just like bananas!!! Thanks to all of you for taking a look at the previews last week -- I hope you liked them! I'll be back to my regularly scheduled blogging tomorrow!! ;) Have a wonderful spring day -- thanks for the visit! I'd like you to meet Frankie. She's the third girl in the Glam Girlz set by C.C. Designs. She's definitely fun and funky, eh? I thought this SU! Summer Picnic paper would be perfect for her! I colored her with Copics, and I added Stardust Gelly Roll pen to the rims of her glasses and to the bangle bracelets. The red ribbon and blue dotted ribbon are from May Arts, and the flowers are from Prima. The red brad is from SU!. 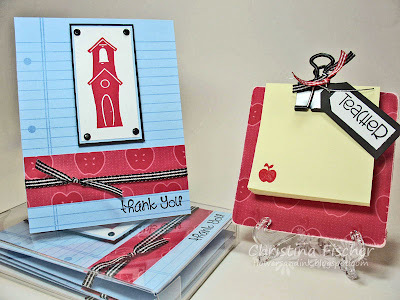 Cardstock and oval punches are also from SU!. Here they are all together -- the Glam Girlz! 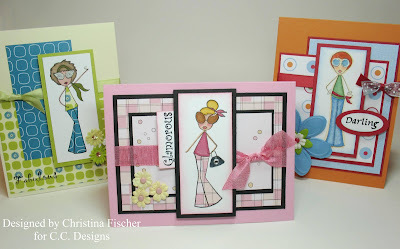 Stop by the All That Scraps Blog for more samples and a giveaway! Then join us tonight on the All That Scraps Message Board at 11:00 PM est for fun and giveaways before the release at 12:01 AM est!! Meet Gwenny. She's very glamorous, isn't she?!? She has her cool shades and her patent leather handbag -- I think she's ready for some power shopping! Gwenny is another of the Glam Girlz by C.C. Designs. I have to tell you -- I *love* this set!!! So perfect for girlfriends, teenagers, girls night out -- so many possibilities! 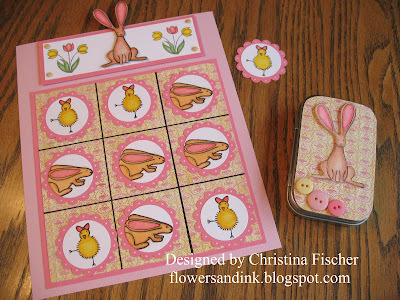 And, it's a great set for paper piecing -- I did it again on this card. I used Chick-A-Dee paper by SEI. I colored the rest of her with Copics. I added Crystal Effects to her glasses and handbag, and of course there's a little bling, too! 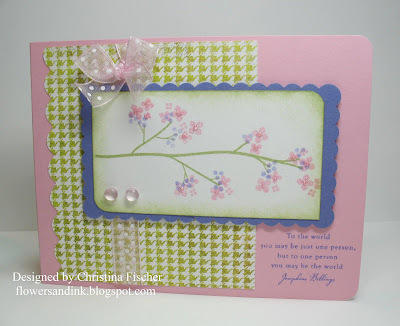 The other embellishments are May Arts two-toned ribbon, Prima flowers, and SEI Chick-A-Dee brads. * Glam Girlz, A Hootin' Good Time, and the monkey sentiments will be available for purchase Sunday, May 4 at 12:01 AM est. Glam Girlz will be sold individually or as a set. If you buy the set, you'll receive a Stardust gelly roll pen free! 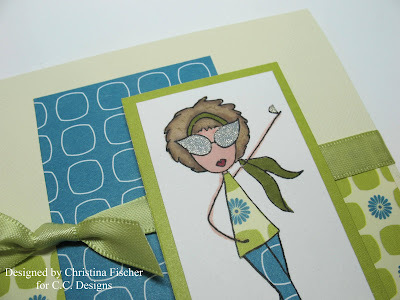 * Christine is having daily giveaways on the All That Scraps Blog -- you can see other Design Team samples there, too! This is Shari. 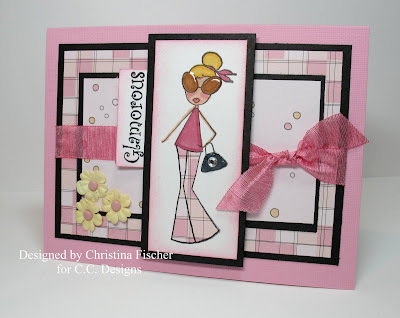 She's one of the new Glam Girlz by C.C. Designs. She has two friends -- you'll meet them later. They will be available individually or as a set. The girlz and the owls will be released at All That Scraps May 4 at 12:01 AM est. I used another kit to put this card together. All the paper, cardstock, and embellishments were included. 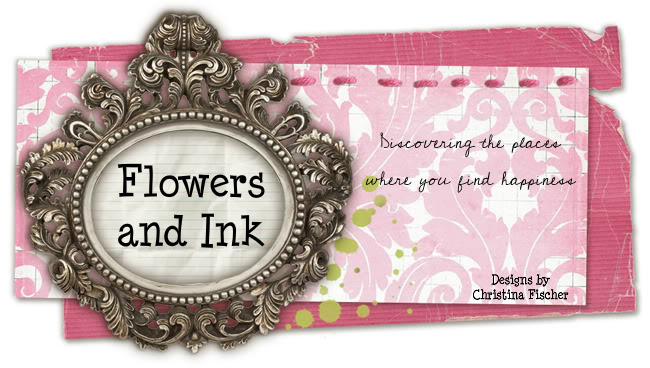 Christine will have the supplies available with the new stamps. 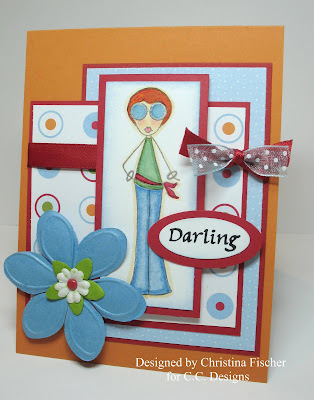 I paper pieced her outfit with these fun Citrus Kick papers by SEI -- isn't she just groovy?!? I colored the rest of her with my SU! markers -- they just haven't had enough love lately! The really fun detail is the Stardust gelly roll pen on her glasses and ring! When you buy the set of girlz, the Stardust pen is free! I can't wait for you to meet Shari's friends, Gwenny and Frankie! I hope you'll stop back to see them! Be sure to check out the ATS Blog each day for more Design Team samples and some giveaways! Also, I wanted to let you know that there will be a gathering on the All That Scraps Message Board Saturday night at 11:00 PM est. Christine will give away the stamps there, too!